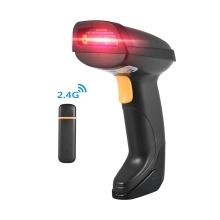 2.4G wireless handheld barcode scanner features fast and accurate in 1D codes reading(on for screen scanning). Widely used in supermarkets, warehouses, logistics, libraries, banks, postal service, industrial and manufacturing process management, etc. Wireless handheld barcode scanner with receiver, high-speed and accurate. 2.4G wireless transmission and effective range about 20 meters(open area). With buzzer and LED light for indicating operating conditions. High-capacity lithium battery and low energy consumption; charged by the USB cable. High rebound button and comfortable handle design for long time easy usage.